How to change style of hyperlinks within PDF published from org-mode document? I'm exporting (publishing) an org-mode document to PDF, and the results look great except for the hyperlinks. They look terrible. Hyperlinks to the Web look the same, only with a pale blue outline. How can I control the style of links in the exported PDF document? (I don't know LaTeX, but can make simple configuration changes in LaTeX if necessary). 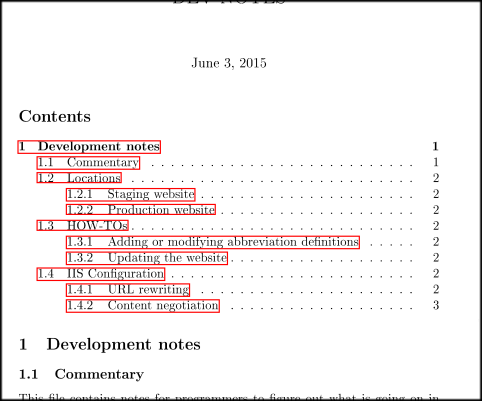 Hyperlinks in pdfs exported from org documents are generated by the LaTeX hyperref package. This package is included by default, and options can be set in the customize interface for org-latex-default-packages-alist. For example, adding the option colorlinks=true to the entry for hyperref will switch from boxed links to coloured links. There are quite a few options you can set, listed in the hyperref manual. While the previous answers are helpful, I'll add a bit more of an explicit recipe for Org mode. This particular command directs the url package to break long URLs at the end of the page over hyphens. The first line adds the xcolor package with X11 color names, and the second line specifies several options for the hyperref package, with the relevant option for this question being colorlinks = true. See the Package Options section of the hyperref documentation, and the Colors By Name section of the xcolor documentation for more information on the available hyperref settings and X11 color names, respectively. How do I get rid of the red boxes around the links in the TOC?